Christian Ministry as a Contributor to Poverty? In some instances, we hold a reductionist understanding of the Gospel. We seek to save the soul, while disregarding the body. We give people a message of salvation that includes a prayer for forgiveness without giving them a community that helps them in their hunger and need. We provide a spiritual solution for physical problems. Conversely, we may use their bodies to reach their souls. We offer food and assistance so that they listen to and respond to our message of salvation. But this often leads to Rice Christians: those that respond to manipulation with manipulation, responding to the thin messages of salvation in order to satisfy their present needs. Sometimes we patronize the poor. We have experienced something that we know everyone needs. But when we try to give to others, we aren’t always postured as receivers. We assume that we know their problems, and we come with the solution. Although we may not understand the cultural and social dynamics of the marginalized communities, we come with solutions that have worked in our communities. Moreover, we treat the marginalized as our projects and our mission objectives rather than as people and precious relationships. In some circles, Christians promote a skewed understanding of blessing. We affirm that God’s blessing is evidenced by wealth and prosperity. We tell the poor that if they come to a proper relationship with God, they will be blessed, and this blessing will lift them out of their poverty. Those that preach this gospel assume that their own material status is a sign of God’s favor. Those that do not rise in status are presumably not living in proper relationship with God. Although this message is highly attractive to the poor, it primarily serves the preachers of this gospel at the expense of their audience. Sometimes we disempower the poor. We may come with aid and inadvertently destroy vulnerable small businesses in the community. Or we may offer our charity without taking responsibility. This happens when we give money to charities that help poor factory workers while purchasing cheap clothing made in those factories. The other side of this is when we offer charity without developing responsibility. When people are treated like donation receptacles, they become dependent on charity and lose a sense of responsibility for what they receive. When the Gospel doesn’t address the whole person but just their “spiritual” needs, the poor are left hopeless in their poverty, thinking that God is either baiting them through their physical needs or unconcerned in this life with their physical plight. When we patronize the poor, the vulnerable are further marginalized, exploited and objectified. When we promote a skewed understanding of blessing, we create discontent and guilt. Worse, we paint a picture of a god that relates to and through the wealthy, relegating the poor as cursed. When we disempower the poor, we keep them in their poverty, subordinated to our “generosity” and numbed in their dependence. By giving charity we may quiet our conscience without addressing the structural causes of poverty. A few days ago, I posted an exchange of comments on a Fox News article about the Wall-Street Protests. You can read that by clicking here. – Is the current situation in which 1% of the population controls 40% of the wealth just or unjust? – Is the fact that the very wealthy are getting wealthier and the poor poorer just or unjust? – Is there a problem with the current system (which implies economics, politics and religion)? – Do you have proposals for reformation or transformation? 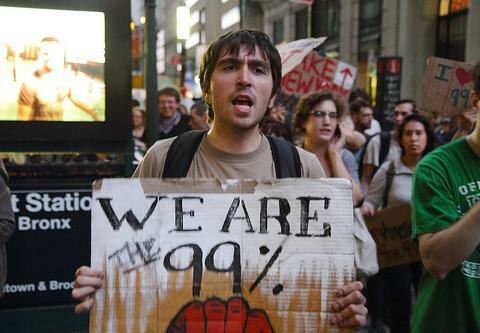 On October 16, I shared on facebook an article written by Fox news on the “Occupy Wall Street” protests. Although I’m not the biggest fan of Fox News, I think the article is an excellent depiction of the protests. After that I received some comments from my friend John Malek. Because I think his views are such a good representation of many, I thought I would post the conversation on the blog. This is also an easier format through which to engage one another’s ideas. You are welcome to join in on the conversation.